now there’s a nice word ! Some days ago, I played a few rounds of the game “Hangman” with them. Noor constructed a word that I’ll remember for a very long time. After I’d guessed the 2 letters that made up the last 4 of the 9 letter word, the first five seemed kind of obvious. I mean, the 5 letters to come before the last 4 -which were “Mama”- would have to be “sweet”, no? Or so my eager heart wanted it to be ! But I thought I should leave the surprising and delighting of me to her, so went around the alphabet making the wrong choices so as not to “get” it in time. And I was, finally, surprised and delighted with the word anyway, for it wasn’t “sweetmama” after all but “suitemama”. Dev’s e-mail a couple of days ago revived memories of the strong impression Nissim Ezekiel’s poems made on me in school and prompted me to find out more about him on the internet. And I found, in an obituary of him, two lines from one of his poems that I felt spoke to me. Or rather, to the ambivalence I feel as someone who chooses so far to live outside her native environment yet wonders about the rightness of it. Thanks to Dev for forwarding this collection of poems by Nissim Ezekiel, a poet whose “Night of the Scorpion”, a part of our poetry curriculum in class 10, was my first introduction to free verse. to get some more work done. When the evidence is Negative. That, too, is holy ground. as the Will of God. In the darkness, be darkness. and turn away from it.5. I’ve heard it’s not safe. a human place after all.6. How much I have lived! to make it good for others.7. we talked about our lives and things. is only one small leap. and served what was ordered. the simplified act of will. knows neither youth nor age.13. with a little pocket mirror.15. is telling you the truth. may still be out of sight. Son has a new toy. Father has a new idea. Who has neither toy nor idea.18. for a day or even an hour. You may learn to use your eyes.19. with the gifts of God.20. swimming in the Ocean of Human Misery? Yesterday, Indira asked if we could bake blueberry muffins today. Never having noticed before that she is fond of this variety of muffins, I was curious as to the reason she wanted to make them. She told me that she loves the muffins they serve for breakfast on the flight from Nice to Zurich – we almost always fly on Swiss, when we travel back each year to India – and that it is always a blueberry muffin. 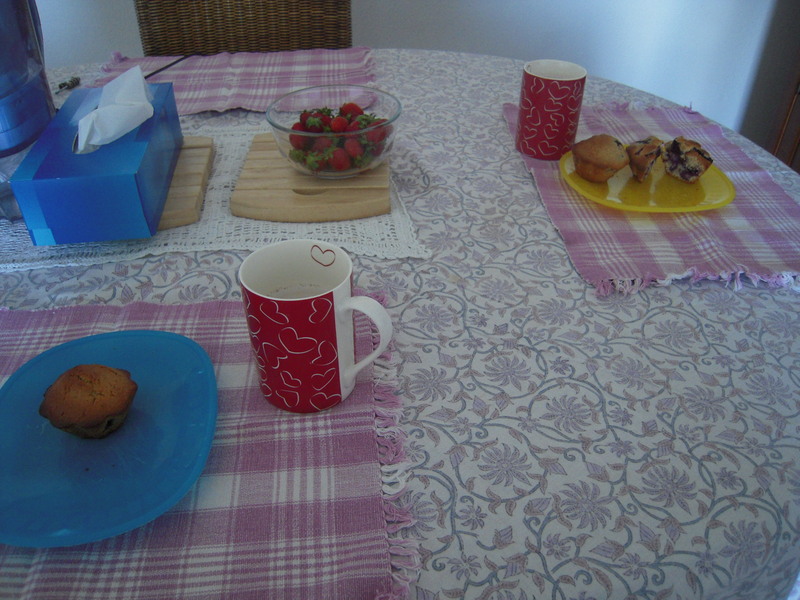 So we picked up fresh blueberries in Carrefour yesterday and made these cupcakes today in the morning for breakfast. In a small bowl, combine the flour, the baking powder and the salt. In a large mixing bowl, cream the butter and sugar. Then add the egg and whisk everything together. Add the milk and the vanilla and mix thoroughly. Now pour in the flour mixture, stir it in well, then add the blueberries and mix them in lightly. Put a tablespoon or so of the batter in to each of the cups of a muffin tray and bake at 200 degrees C for 25-40 minutes till the muffins are nicely browned. While using fresh blueberries as a baking ingredient does feel like a pity to me – the original recipe does say that frozen berries will do as well but the ones we buy here are too sour for my liking and I therefore tend to avoid them – I have to say that these cupcakes are quite nice too, with the delicious taste of the berries spread through as the fruit softens on baking. Today, it was the annual kermesse – a word derived from the Dutch language– or fete in Indira and Noor’s school. This typically involves a dance performance by every class, followed by food and games stands. Noor’s class – the moyenne section – were adorable as they did a German polka. Indira’s class put on an impressive act as they danced to “I’ve got a Feeling” by the Black Eyed Peas. As I watched their well-practiced hip-hop moves, I found myself thinking that this was a far cry from the more sedate stuff we used to do in school all those years ago (cut to a memory of my classmates and me in Grade 5 or 6 or 7, holding candles on stage, dressed in white and singing “God’s love, is so beautiful…” or some such under Sister Manisha’s direction). This afternoon was so much more fun ! Indira and Noor both love to help in the kitchen and I confess I enjoy having willing hands take on all the little chores. On Saturday we made a carrot cake together. I took some for the baby shower we had for Ayesha at Shefali’s home on Sunday and packed the rest for gouter for the dads and children who obligingly spent the afternoon together at the park in Sophia playing tennis, while the women partied at home. The highlight of that baking session was that Indira peeled the carrots. She learned the technique just then but did a remarkably good job anyway. So this morning as I peeled carrots to make salad for the boulangerie, I found myself missing that help !